Tesla beat Wall Street’s earnings expectations on Wednesday, but the stock is falling. 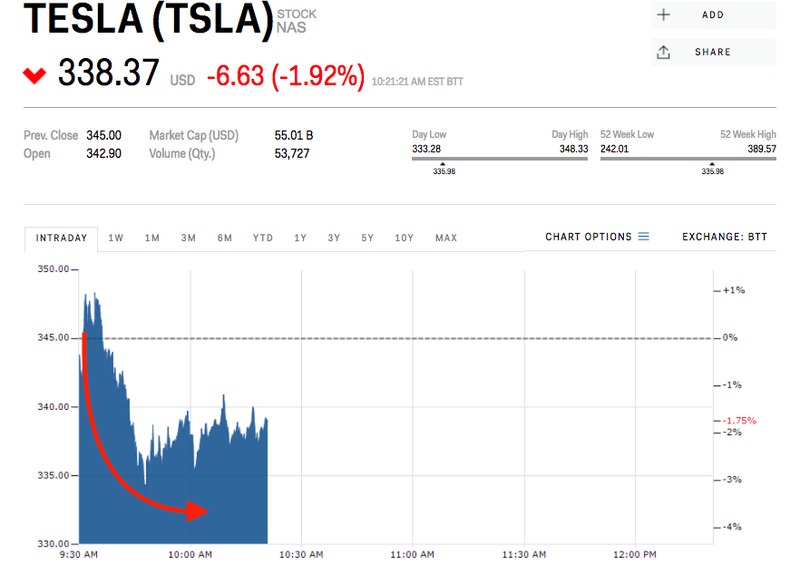 Tesla on Wednesday posted a smaller-than-expected fourth quarter loss as well as a slower cash burn, but it wasn’t enough to keep the stock in the green. Shares are down more than 2% in trading Thursday morning. The electric car maker said it lost an adjusted $US3.04 per share, on revenues of $US3.29 billion – analysts had expected a loss of $US3.16 per share on revenues of $US3.28 billion. Tesla also reaffirmed its forecast for Model 3 production through the second quarter. Tesla has historically missed key production deadlines, delivering just half of the cars analysts expected last month, yet its stock price generally continues to climb. In January, CNBC reported that production of the company’s Model 3 sedan could be even further delayed thanks to an ongoing battery assembly issue. Tesla denied the reports. Wall Street remains mixed on the company’s ability to deliver. 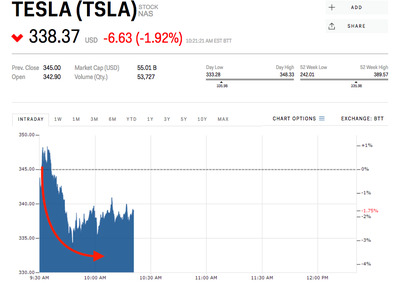 Analysts polled by Bloomberg – only a third of whom have a buy rating for the stock – give Tesla an average target price of $US319, or 5% below where shares were trading Thursday morning. Oppenheimer, one of Tesla’s more optimistic research shops, says the company continues to “wade through the weeds” while production delays remain. “Automation fixes being done in Germany suggest that Model 3 production targets are at risk and that investors will not be surprised by such delays, which we expect will allow TSLA to push out capex payments, reducing near-term cash pressure,” analyst Colin Rusch said in a note to clients. This bullishness is reflected in a measure called short interest, which indicates bets that a stock will drop. The $US29.2 million currently being held short is the least in three months, and 11% lower than a seven-month high reached in December. Shares of Tesla have gained 5.45% this year and 29% in the past 12 months.